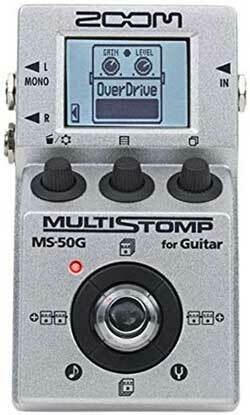 The Zoom MS-50G MultiStomp is a type of pedal I wish I saw more of. 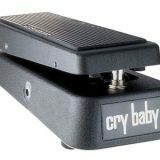 It’s a multi-effects pedal packed into the size of a typical single-effect pedal. For a lot of guitarists, a massive multi-effects pedal with 10 footswitches and expression pedals is overkill. The MultiStomp lets guitarists access a wide range of effects while keeping the pedalboard simple. If you look through the list of effects here, you’ll see what the MultiStomp offers. You’ll also see what the effects are based on. 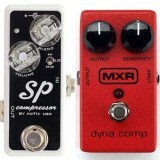 For example, the COMP is based on an MXR Dyna Comp, the Dist 1 is based on a BOSS DS-1, etc. It’s a great way to learn about different effects as well as compare pedals. For example, you can easily compare the sounds of an Ibanez TS808, BOSS DS-1, Pro Co Rat, and EHX Big Muff. If you ever decide to buy the real deal, you’ll know exactly which one is right for you rather than guess based on popularity. It’s worth mentioning that there are plenty of multi-effects pedals out there. The Zoom G5 is a fantastic multi-effects pedal and Line 6 have a great range of multi-effects pedals. The problem with most multi-effects pedals is they take up a lot of room. That’s fine if you know the pedal has exactly what you’re looking for, but if you’re still developing or learning what effects you like, it’s too much. The MultiStomp gives you a great way to mix and match different effects without taking up any more room than a typical pedal. It’s pretty clear that an overdrive is active and the three knobs match the three settings shown on the screen. If you’re used to using normal effects pedals, this design will make perfect sense to you. It’s also why I liked the Zoom G5 so much. It looks and acts like a typical stompbox. There’s no mistaking what the above pedals represent. The far left ‘T Scream’ is clearly based on a Tubescreamer. If you select that effect, the three knobs would control the Gain, Tone, and Level knobs – just like a real Tubescreamer. Being a multi-effects pedal, you can chain together up to 6 effects or amp models. This allows you to create complex rigs using multiple effects at once. Or you can go the simple route and use it like a normal stompbox. I feel using the MultiStomp like a normal stompbox is what makes it so interesting. For one song you can use it like a fuzz distortion, the next song can be a phaser, etc. If there’s an effect you’re only going to use on occasion, it makes sense to use the MultiStomp rather than clutter your pedalboard with effects you barely use. If you’re starting out learning guitar, you probably don’t know what effects you want as part of your tone. You might have an idea, but your preferences will change over time. 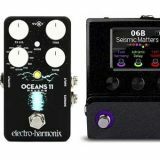 Having a multi-effects pedal is a great way to learn what all the different types of effects are, how you can use them and whether you like them or not. The MultiStomp gives you a cheap way to try out a wide range of effects without having to buy separate pedals only to find out later that you’re not interested in them. Even if your amp has some inbuilt effects, I highly recommend getting a pedal like the MultiStomp. If you’re the type of guitarist who prefers a basic tone, there will be times where a song uses an effect you don’t have. It doesn’t make sense to buy a phaser pedal if you’re only going to play it on one song, but a pedal like the MultiStomp does make sense. It’s a great way to access any effect that may come up without needing to buy more pedals. Have you ever tried out a new pedal and spent the next few hours jamming away, full of inspiration? Any new effect can be a source of inspiration when you’re feeling flat. The MultiStomp has 100 effects available, which can be an endless source of inspiration. 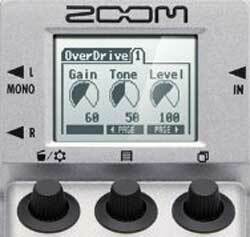 Check out the current price and full details of the Zoom MultiStomp here. The MS-50G originally came out with 50 inbuilt effects. You can bump that up to 100 effects by updating the firmware to the latest version (currently v3). To check your current firmware version on the MS-50G, open the menu by pressing the left knob. Scroll down using the left knob and select version. If it doesn’t show version 3.00 or higher, go to the Zoom website here and download the latest firmware for your system. 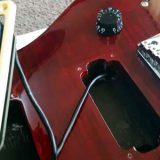 To update the firmware, connect the pedal to your computer with a USB cable while holding down the up and down buttons. The screen should say “Ready for firmware update”. You can then run the firmware update application you downloaded. After updating the firmware, check the version again with the above steps. If you’ve never experimented with stereo effects or a stereo rig before, this is a great way to see what it’s all about. Some effects sound fantastic with a stereo rig and can add a lot to your tone. If you have two amps (or can borrow somebody else’s amp), connect the two outputs to the two amps. Look for effects that mention stereo such as the Stereo Chorus or the Stereo Delay, or search for ‘stereo’ in this effects list. Keep the amps separated so you can widen the stereo field and start jamming. If you’re looking for ways to get a bigger tone, this is a great starting point. While the layout of the MultiStomp is pretty easy to understand, there are some advanced features hidden in those menus. This MultiStomp manual will give you quick step-by-step instructions on advanced features such as changing the type of tuner, backlight dim time, power management, etc. There are plenty of multi-effects pedals out there, but none as compact as the MultiStomp. A close alternative in terms of size and features is the Line 6 M5 Stompbox Modeler. It’s bigger and has two footswitches, which makes it easier to change between presets. If you’re looking for something with higher quality effects and a bit more flexibility, the Line 6 HX Effects is worth checking out. It’s far larger than the MultiStomp, but not quite as large as a typical multieffects pedalboard.